At the age of six I fell in love with dance. I started out in ballet and my passion grew from there. I love the beauty and grace of dance as well as the overwhelming peace and freedom of performing on stage. 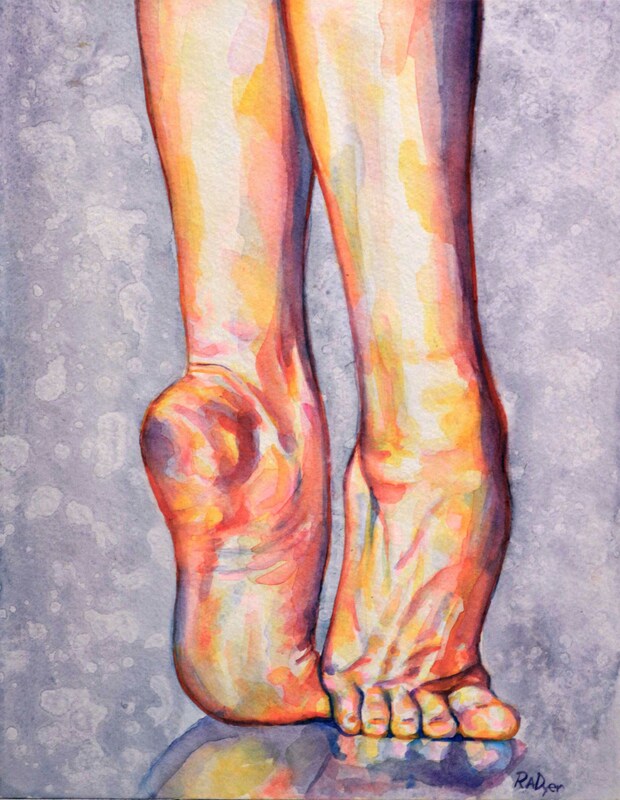 Chronic injuries plagued my professional dance career which is what eventually led me to my art. I took art classes in high school but it wasn’t until I was dealing with chronic injuries that I had the time to really start painting. I am mostly self taught with influences from a creative and talented family. After selling my first painting 4 years ago I have been making art non-stop. Most of my art is figurative and inspired by my love for dance. Through my art I strive to capture the motion and emotion of the dancer in a simple still moment. Dance is always a theme in my life and I try to bring it to a new audience through my art. So most of my work is figurative or portrait based with strong dance themes. Lately I have been using a mix of watercolours, coloured pencils and acrylic paint. I recently got a beautiful set of coloured pencils that I have been using on everything I can! There’s a mermaid in my head begging to break free but until she’s ready to hit the paper I have an assortment of smaller projects on the go. I always hope that my viewer finds something to relate to. Often I go into a painting with a specific emotion or phrase in mind and I hope that that comes through to my audience. I think one of the biggest challenges of making art is making art consistently. I go through creative highs and lows and sometimes weeks without actually creating anything. These lows are frustrating but I’m learning to use that down time to experiment with smaller things and new media until I feel inspired again. At times my art has been all about the emotional release that art provides and other times it is more narrative. I think the more I paint the more these two things combine. Generally I dislike at least one thing about everything I make. The critic in me is relentless but I am learning to let these things go; at least a little. One day when I have time and space I want to dive into oils. I love the classical medium and time and attention that oil paints require. I just hate waiting for paint to dry! I have collaborated with my friend Sebastian Olejnik off and on for a few years. He makes really cool line drawings of crazy things that I have taken and turned into paintings and T-shirts. He sees a lot of my art in progress and often contributes more than he takes credit for. I really enjoy these collaborations because his ideas are so different from mine and the work we create together is very different from my other art. I sign all of our collaborative work SoRad which is a fun combination of our initials! I follow as many artists as possible. Twitter and Facebook make this an easy thing to do and I love seeing the art in its progressions to the final stage. A few of the artists I follow are Kelly McKernan, N.C. Winters, Dan May, Audrey Kawaski, Danny Roberts and so many more! I am embarrassed to say that I am in between books… I love reading and don’t do enough of it. I have a copy of Grimm’s Fairy tales sitting on my bedside table waiting to go! Michael Ondaatje, C.S. Lewis, J.R.R. Tolkien, Charles Dickens, Charlotte Bronte, Alexander Dumas…obviously I’m into the classics! I listen to a lot of random things. Classical music is a large part of my day in ballet class but lately I have ‘Birds of Tokyo’ and Karnivool’s latest album on repeat. I also love Florence and the Machine, Mutemath, Elbow and I’m a big Lady Gaga fan. The last concert I saw was the Neighborhood… or Ellie Goulding, I don’t remember. My next concert is Elbow, which I am really excited about!